Musk on Model 3: "I am definitely under stress... I need to discover how to do better"
Elon Musk is sleeping on the floor of his Tesla factory - literally. At one point Musk tried sleeping on a couch in one of the production facility conference rooms, but he told the CBS This Morning co-host Gayle King that the couch was too narrow, so he ended up sleeping on the floor. The new interview with Tesla's CEO was the first time that television cameras were allowed on the production floor of the Model 3. While the interview did not provide any revealing information, it did show Musk speaking frankly about what his company has done so far, and where he has not met production goals. 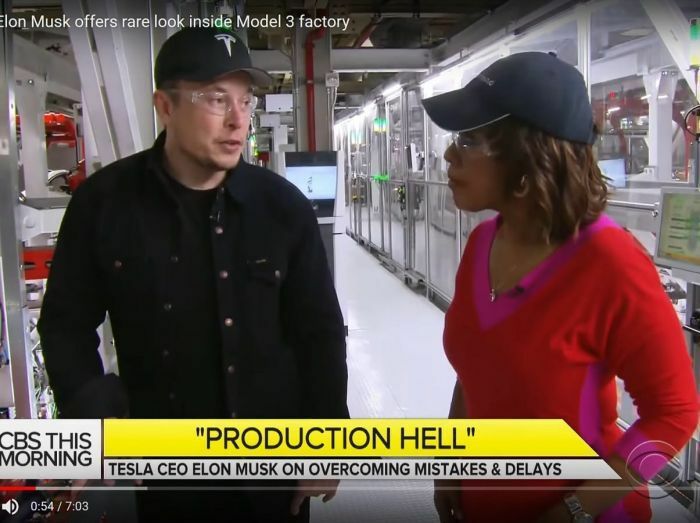 "I need to figure out how to do it better," Musk said in response to journalist Gayle King's question about production targets that continue to be missed. The change from Model S and Model X to Model 3 has been difficult, which led Musk to coin the term "production hell". When King asked if the production problems of the Model 3 were within his expectations, his answer was simple: "It's worse than I thought, we trusted some of the things we thought were our core technology." But, over time, production seems to be improving. In the first quarter of this year Tesla was closer than ever to its production estimates, even if they are lower than originally anticipated. "We will probably have a three or four-fold increase in production of the Model 3 in the second quarter," Musk told King. He believes that he now has a "clear understanding of the path out of hell." Also, don't miss our morning story in which Musk expressed his confidence that Tesla will be cash flow positive in the 3rd quarter of 2018.